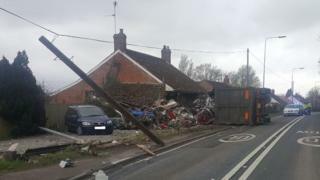 A goods lorry crashed into a house after striking a telephone pole and street light in a village near Bridgwater. The crash caused significant damage to the building on the A39 at Bawdrip, police said. The lorry driver suffered minor injuries and was taken to Musgrove Park Hospital following the incident on Wednesday afternoon. The householder, who was home at the time of the collision, was unhurt.